I remember the day so vividly! The day I told my children that I was not having a dishwasher installed in the new house becasue I get joy out of washing dishes. The look on their faces was priceless and I could see that each of them was very relieved they no longer lived at home. I also could see the wheels turning in their heads on just how they were going to wiggle their way out of doing dishes after a holiday dinner. It still brings a smile to my face as I think about it. I have to admit there are very few chores around the house I don’t enjoy, but washing dishes is one of my favorites. There is something soothing about standing at my sink watching my chickens dig for worms, see the seasons change in my kitchen garden or watch my husband chopping wood. It is a chore that I repeat many times throughout the day. A chore that brings me the most satisfaction when its complete and the one that is always at the top on my to-do-list. As I was washing dishes this morning I got to thinking about who taught me how to wash dishes? If I think way back I remember standing at my grandmothers sink washing the breakfast dishes as she sat having coffee with my mom and dad. As a child I know my sister and I always had the after dinner chore and I don’t remember drying dishes, but I always remember washing them. I bet each of us has a system and wash dishes the same way every day! I fill the sink with hot soapy water. I put all the silverware in the bottom of the sink to soak while I gather all the glasses to wash. I then soak the pans as I wipe down the table and counter tops. Once I wash the pans I soak the frying pans while I clean the stove top. After I wash everything and they are in the dish drainer, I clean and dry out the sink. I never dry my dishes since they can air dry while I work on something else. How do you wash dishes? Do you do the silverware first or glasses first? Do you do them right after a meal or let them sit until the next day? I would love to hear your routine! I too enjoy washing dishes. It’s meditative. Glasses first, then plates, bowls, silverware, then pots and pans. Hubby does the supper dishes, and I do the rest. That’s great your hubby does your dinner dishes! My hubby helps by cleaning the table off everynight. Your routine sounds just like mine, so maybe it’s an unwritten rule on what order you wash dishes? I can’t say I love washing dishes (although it’s an okay task) but I was taught the “right” way to do dishes by my mom, who taught me you must wash silverware and glasses first. I guess that’s because we put our mouths directly on these things???? Gail I would say that make! It’s amazing when you think of just how many dishes we wash in a lifetime. Such a simple but important task. April, I have read that about an Amish woman’s chores before and couldn’t agree more. Thank you so much for sharing your thoughts with us! 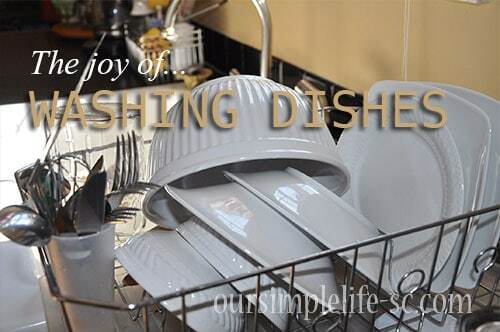 I’m thankful for my dishwasher, but I can relate to the joy of a simple routine like washing dishes! There is something soothing about slowing down instead of rushing through every chore. Especially if there is a kitchen sink window. And I always make a point to wash my glasses first and my pots and pans last, too! I couldn’t agree more…there is something soothing about slowing down through certain chores! Oh my goodness! My mom LOVES washing dishes and we have been teasing her for years. I guess she’s not alone in her love for dish washing. She says it calms her at the end of the day. Since I’ve started taking over many of the homemaking duties and I use the dishwasher. I love it. But, sometimes to keep both of us happy, I will leave the pots and pans for her to wash. She and I work as a team now. I am very happy you wrote this and I cannot wait to tell her. Tell your mom she is not alone in her love for washing dishes. I view it as my time with my thoughts…my hands are warm, my spirit is rested and a chore is getting done! Thanks for sharing! I do not like washing dishes at all. They accumulate until we’ve run out of things to eat and drink from. I’m awful about getting them done. There is nothing regular about my daily schedule which makes it even harder. However when I do get around to them I usually wash the big items such as pots, pans, cookie sheets etc. first then I dry them and I change the water then I do plates and bowls and tupperware. Then those get dried. Then I do glasses and finally silverware and other utensils. The glasses air dry but the silverware I dry by hand otherwise it gets cloudy. I stumbled upon your blog a few days ago and have been devouring it ever since! Your lifestyle is exactly what my husband and I are saving money to acheive. We have three girls (13, 9, and 4) and live in Massachusetts. Once they are grown we want to retire to Maine, buy some land and have a small farm (milking cow, chickens, goats, vegetables, and plenty of hunting land). Thank you for your lovely blog. I have really enjoyed reading your articles and will continue to do so. Thank you for the sweet comment! I do love washing dishes, and your order was pretty much what I was taught by my mother and her mother taught her before that. I would say we are doing in correct then! After all these years washing dishes I would say we all have earned our Brownie badges many times over!